The 70's are back….again | StyleAble Fashion For Everyone! The 70’s are back again…but you knew that. Even those who are not interested in fashion trends will not have failed to notice the many 70’s references around them – from food to interiors to the soar in vinyl record sales. If you were around the first time (I was born in the 70’s), you’ll know exactly what to do, as it seems not much has changed (call me a cynic). Suffice to say, I am not overly excited (didn’t we just do 70’s? jeez!) as to be honest the 70’s trend is one that just keeps on coming back and to be fair, if you don’t know how to work it by now then it may be worth giving this trend a complete miss. For those of you who are up for some fringing and A-line fun, you will be happy to know that this is a trend that will be sticking around and will actually span across a couple of seasons – worth the investment? Quite possibly. What’s more, you won’t need to go far to find 70’s pieces, they are everywhere. Zara, H&M, Topshop are the usual suspects and as usual they will not disappoint. 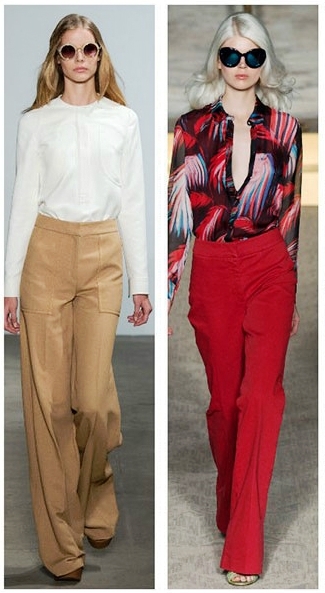 Flares – high waisted, low slung, short, long, culottes (it really doesn’t matter) the flare is the silhouette of the season. Mostly, I find flares to be a little unflattering. If like me, you are slightly bigger on bottom, opt for long flares with a wider cut, or go for full on culottes which are flared all the way down. Don’t be afraid to wear them big, if they cover your shoes you’re pretty much there! So there you have it…have I missed anything?